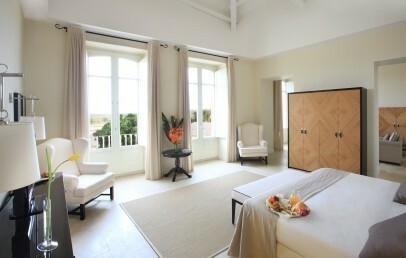 In the southeastern part of Sicily is located I Monasteri Golf & SPA Resort, approximately 12 km from the sea. The two cities between which it is located, Syracuse and Noto (the capital of Sicilian Baroque), are both UNESCO World Heritage Sites and are a must-see step of your trip. The nearest airport is Catania at approx. 65 km distance. The Hotel was created by the modernization of an ancient Benedictine monastery, now a 5-star hotel surrounded by green palms, carob, olive and citrus trees. It incorporates the features of the Roman farm villa and offers air conditioned common areas, modern and elegantly furnished. In the entrance driveway there are several patios leading to the panoramic terraces, where guests can relax with a glass of good wine. The hotel has 102 rooms, all are comfortable and have air conditioning, safety-box, satellite TV, minibar, bathroom with shower, hairdryer; the Suite has a tub and shower. Superior – 35 sq.m., located in the central part of the resort around the pool. Deluxe – 45 sq.m., located inside the little village of the resort, overlooking the golf course. Junior Suite – 50 sq.m., located inside the old monastery, this accommodations are among the bigger ones, with night and day zone, overlooking the golf course or the internal patio. 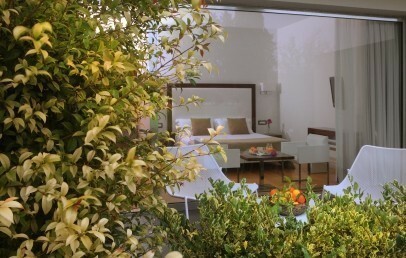 Suite – 60 sq.m., located at the inside of the historic dwelling, with night and day zone, overlooking the golf course or the courtyard of the monastery. 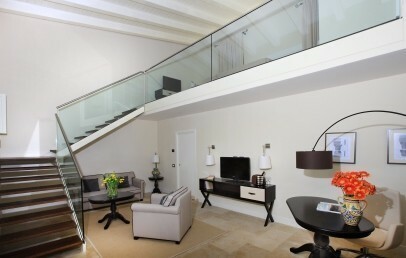 Adult guests staying in the Junior Suites or Suites have included in the price one daily access to the SPA. Every room can be booked with the Summer Package that includes: Outdoor pools; 1h 30 min Spa entrance per adult every 3 nights of stay; Spa KIT: bathrobe, slippers, towels; fitness room; local coach available to suggest itineraries and organise the discovery of the surroundings; PC in the business centre; parking. For the complete relaxation of the guest, in order to relax and concentrate on your vacation and on your wellbeing, the I Monasteri Golf & SPA Resort has studied a well-equipped wellness center as a "refuge from the outside world". At the ZAGARA SPA by Clarins guests can take advantage of the experienced hands of professionals and regain their balance. Among the services offered are: sauna, Turkish bath, emotional showers, Jacuzzi and treatment rooms. Possibility of treatments for individuals or couples. The golf course is definitely one of the highlights of the hotel: inserted in a plantation of 86 hectares of oranges and lemons, it is immersed in the fragrances of the Mediterranean vegetation, myrtle, laurel and citrus fruits. It is a 18-holes golf course, par 71 and has 6,250 meters; some holes are framed by walls of white limestone. On request it is possible to practice horse riding, diving, sailing in the nearby. At the restaurant “Sala Laghetto” guests can enjoy a rich buffet breakfast as well as à la carte lunch and dinner with Mediterranean cuisine are served at Albatros Restaruant. On request can be prepared special menus for vegetarians and intolerances. Available hotel services are: swimming pool, free unguarded parking, free internet Wi-Fi connection in public areas and in the rooms; rentals, tastings and tours on request. Tourist Tax – Euro 2,50 per person for the first 4 nights, children under 12 years and guests over 80 are exempted. During the months of January, February and November the amount of the tax is reduced by 50%. The tax has to be paid on-sitet in cash at the moment of the check-out. The Superior rooms are located in the central part of the resort, that surrounds the hotel pool. The furniture is modern and functional and the rooms are equipped with: private entrance, parquet, bathroom with shower, air conditioning, TV, minibar, hairdryer and desk. All rooms have a veranda furnished with a table and chairs. Located inside the ancient Benedictine monastery. These rooms are among the most spacious of the Resort. They overlook the golf course or the interior patio of the ancient house. The Junior Suites have a independent entrance, a living area divided from the sleeping area, some with mezzanine, a sofa bed, a 32"satellite TV, a king-size bed, a bathroom with a large shower, a hairdryer. air conditioning, desk, safety-box, minibar. 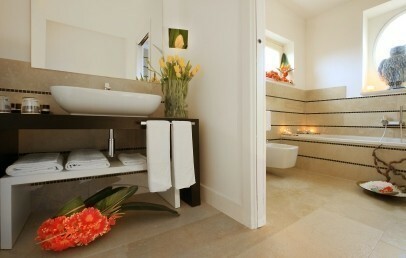 The adult guests of the Junior Suites have included in the price one daily access to the SPA. Located inside the ancient historical residence. The Suites overlook the golf course or the monastery courtyard. They have a sleeping area separated from the living area and have a independent entrance, sofa bed, 32"satellite TV, king-size bed, bathroom with shower and bathtub, hairdryer, air conditioning, desk, safety-box, minibar. 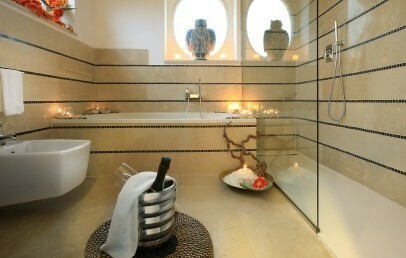 The adult guests of the Suites have included in the price one daily access to the SPA. 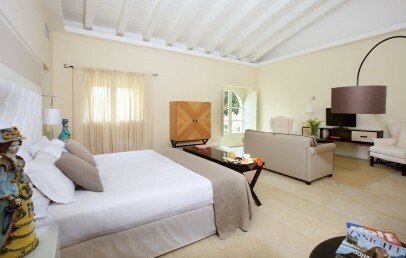 These rooms are located inside the little village of the resort overlooking the golf course. 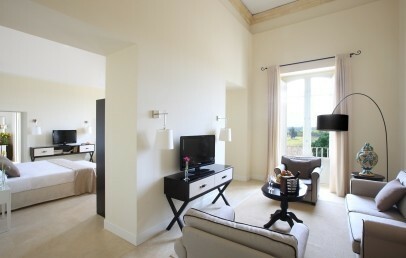 The rooms are furnished in a classic and elegant style that fits perfectly with modern comforts. 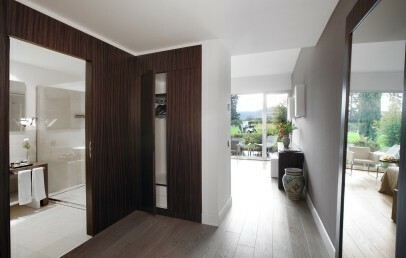 Spacious rooms with double bed and bathroom with big shower.